S302, Silver Color, Scroll Invitations, Jewish Invitations, Anniversary Invitations, Box Scrolls, Cinderella Wedding, High End Scrolls. 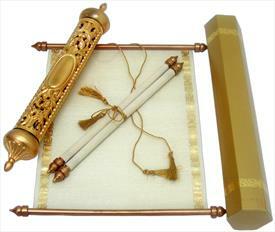 The scroll has hot foil printed silver border on both sides. It is contained in a beautiful handcrafted plastic container with nice designer carvings giving a look of a perfect royal invitation. It goes in to a hexagonal box, which too has hot foil border matching to the main scroll. 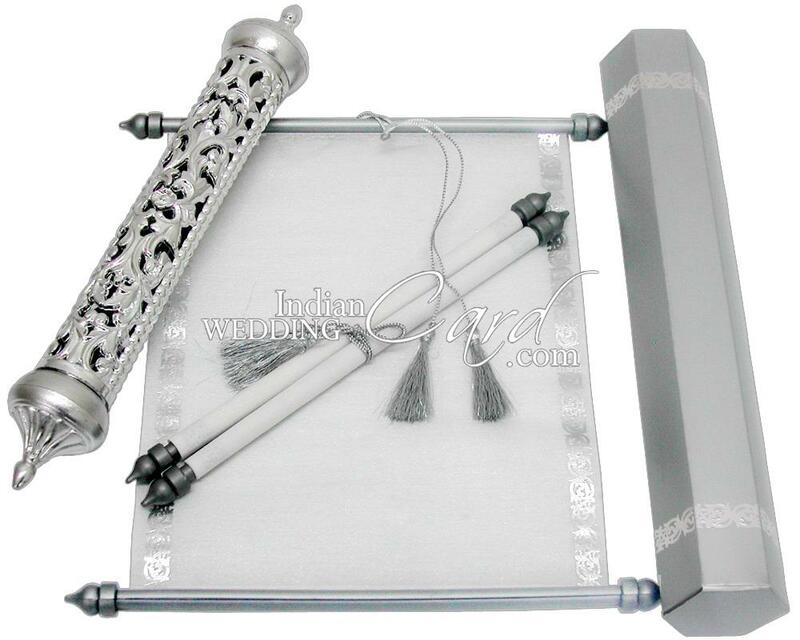 Scroll is in Shimmery translucent white wooly paper (80gsm) with silver bar and silver zari tassel and is contained in Silver finish handcrafted plastic case; Matt Finish Silver Metallic paper (300gsm) for outer mailing box.